Circuses and trained animal shows seem to be a vanishing breed these days, as we’re becoming more sensitized to the mistreatment of animals. Barnum and Bailey is gone and SeaWorld is not far behind. But there’s one way to experience the mysteries of the circus without harming a soul. Want to smell the hot roasted peanuts and popcorn, while bearded ladies, lion tamers, contortionists, ghoulish clowns, and fortune telling felines wander around? Want to pose with a giant squid who is more than happy to oblige just for the sheer pleasure of it? I’m referring, of course, to Iliana Cerise’s and Kitty (aka Vinje Resident)’s wonderful and dazzling party this month. It’s hard not to notice them. Iliana is the beautiful DJ in full circus regalia, spinning circus-inspired music, and Kitty, well…Kitty’s the cigar chomping impresario in the natty black top hat, with a button reminding us that “Sinners Are Winners.” These two have been putting on the best parties on the grid for some time now (see the July 2017 issue of rez for their Space Party). Jami Mills gives us her impressions and some lush photographs of the affair in Freak Show! Be sure you don’t miss their upcoming Halloween party, which promises to be epic. 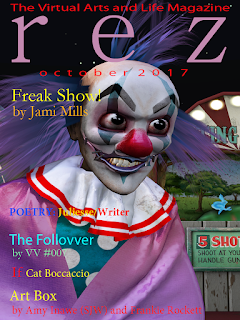 Amy Inawe (SJW) teamed up with Frankie Rockett this month to bring us a fascinating article, Art Box, which describes the amazing installation produced by Frankie Rockett and Violet Sweetwater, where you are placed in the center of countless classic works of art, like The Scream and American Gothic, becoming a part of the piece. A superb poet, Amy is every bit the consummate prose writer as well, and we’re glad she keeps coming back to our pages. Someone named VV #007 has contributed a bizarre piece called The Follovver, about a service one can hire to have someone follow you at a discreet distance and send you a photo of yourself. The writing style is strangely familiar to regular readers of rez, and the subject matter is nothing if not creepy. Cat Boccaccio has contributed another of her fine examples of the best micro-fiction anywhere, hands down, with It, which reminds us of how we teach our children by example, and how precious is their innocence. DearsLuv Writer has brought us a very emotional poem this month, Divorce, which describes, in painful verse, how hearts aren’t broken, they’re ripped and shredded, by divorce. And last but certainly not least, the incomparable Jullianna Juliesse gives us her impressions on her move to the Midwest, in Diary of an Ex-Suburban Housewife Written From Exile in the Midwest. Pull up a chair and have a read. Loved reading this review and its great. I have been looking for this post so long but couldn't find. Thanks for sharing it.